60% Cotton 40% BambooWomen's Bathrobe: (M Size)Men's Bathrobe: (L Size)Face Towel: 50x90 cm (2 pcs)B.. PRODUCT FEATURESFemale Bathrobe: 1 Piece (M Size)Men's Bathrobe: 1 piece (L Size)Bath towel: 2 piece..
Set Contents1 bathrobe M size1 bathrobe L size2 towels 50 x 90 cm2 towels 85 x 150 cmFeatures40% bam..
Cotton and bambo is a natural product and the most popular natural fiber.It feels&nbs.. 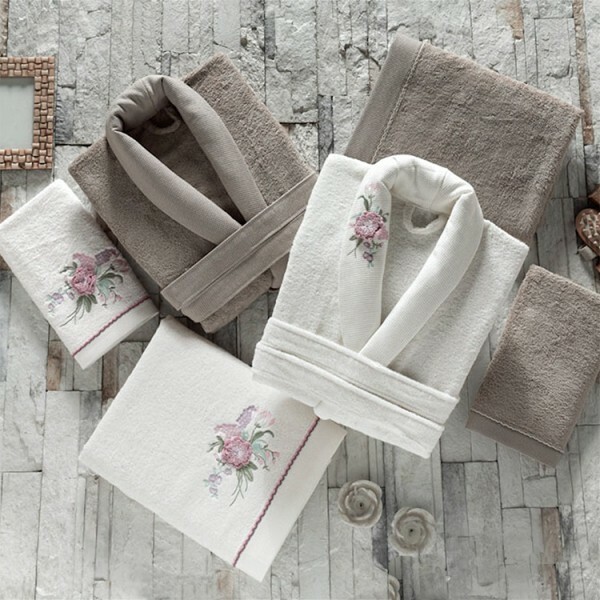 TREND Embroidered 3D Bathrobe set 8 pc. Bathrobe set · 2x ladies bathrobe size: S / M Men Size: ..
2x ladies bathrobe size: S / M Men Size: L / XL· 2x bath towel 90x120..